The first act revolves around the sustained, intense effort by neo-impressionist painter Georges Seurat to compose his famous pointillist painting “A Sunday Afternoon on the Island of La Grande Jatte.” The painting is real, as was Seurat, who took over two years to complete the work. But the story is fictionalized, examining the toll that Seurat’s obsessive working habits take on his relationship with a woman named Dot, and the way his groundbreaking technique draws criticism from the social and artistic elite of 1880s Paris. Seurat (Adam Chanler-Berat) is so absorbed in his labors that he can scarcely tear himself away to spend much time with Dot (Jenni Barber). There’s an implication in James Lapine’s book for the play that Dot’s stint of posing for Seurat on Sundays is an attempt to salvage a relationship that’s being strangled by the painter’s obsessions. It’s rough going, because while Seurat is highly disciplined, single-minded and snappish, Dot is fun-loving and expansive. She’s hardly fit to be locked in a starchy dress and a rigid pose for hours on end, to say nothing of a stifling relationship with an emotionally unavailable partner. I’ve seen the legendary production with Mandy Patinkin and Bernadette Peters (albeit only on YouTube, alas) but I’m hard pressed to say which Dot (Peters or Barber) I love more, or which Seurat (Patinkin or Chanler-Berat) I prefer. It’s not as though these are roles that actors can just sail through. They are fraught and complicated — and that’s before the actors have to come back on the second act as completely different characters. 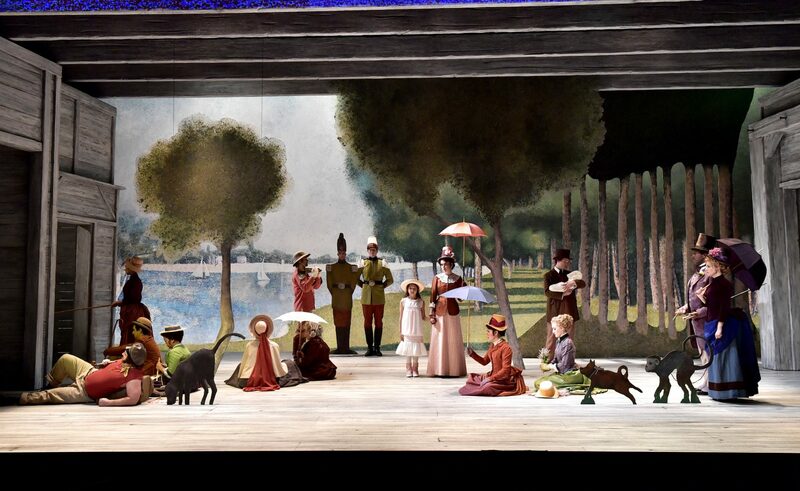 Sondheim’s lyrics make it plain that Dot and Seurat love each other, but his music dictates the terms of the relationship. In one scene, set to the song “Color and Light,” Dot wields a powder puff to the rhythm set out by strings and percussion while Seurat, in his atelier, lays down his brush strokes to the same rhythm with helpless, feverish compulsion. She wants to go out to the follies; he is unable to accommodate her, held hostage by his own artistic need. The moment crackles, as do many others, with two tugs of war, as each character struggles with both inner and outer conflicts. Their relationship produces a child, but things between them end well before Dot’s pregnancy becomes evident. By then, she’s found a new suitor in a baker named Louis (Nick Sulfaro), and her strolls through the park on his arm excite the local gossips. The Huntington makes good use of local Boston talent for this show, and a number of actors appear here who also featured in the Huntington’s production of “A Little Night Music” last September. Seurat’s mother (Bobbie Steinbach, more than holding her own once again) thinks their breakup is a pity; meantime, there’s plenty of romantic intrigue swirling around the margins of the story. Seurat’s mother’s nurse (Amy Barker) is sneaking off for dalliances with Franz (Patrick Varner), who serves as coachman for famed painter Jules (Josh Breckenridge), a friend to Seurat and sometime champion of his work. Jules is also carrying on with Franz’s wife, Frieda (Melody Butiu), despite the fact that Jules is married to Yvonne (Aimee Doherty, a standout even in a smaller role) and they have a young daughter named Louise (played at different performances by either Bailey MacNeal or Margot Anderson-Song). To say that “Sunday in the Park With George” is “inspired by” “A Sunday Afternoon on the Island of La Grande Jatte” might be slightly understating the case. If anything, the musical is based on the painting, insofar as this production echoes the work’s visual elements in terms of costuming (overseen here by Robert Morgan), projection (designed by Zachary G. Borovay) and scenic design (the work of Derek McLane). The characters are drawn from the figures of the painting as well, including a crabby boatman (Todd A. Horman), a pair of women both named Celeste (Morgan Kirner and Sarah Oakes Muirhead), and two soldiers — one played by a flesh and blood actor (Andrew O’Shanick) and one portrayed by a painted cutout figure similar to other figures that echo elements from the painting, such as trees, dogs, and a pet monkey. The lighting design (by Christopher Akerlind) is meticulously aligned to the color scheme used in the design work overall. By the time Act 2 comes along, we're more than ready for the transformation. The characters and design elements are placed in the same configuration as the figures in the painting, and also portray those figures. In a fantastical twist, they aren’t simply representations of the characters we’ve come to know; they exist as those characters in some sort of afterlife, given immortality through Seurat’s skill and vision. The way the painting comes to life serves as a bridge in time, as the story shifts from 1884 to 1984. 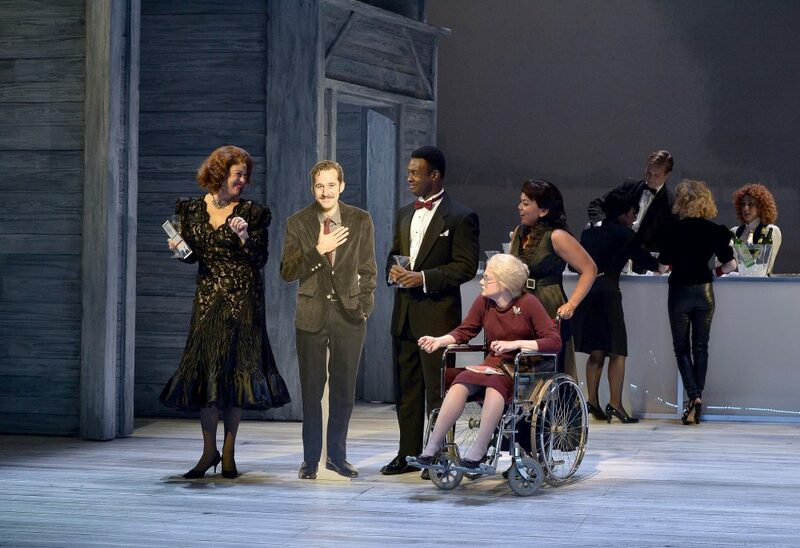 In a splendid riff on Act 1’s use of painted cutouts, George works the room at the subsequent reception like a PR master — striking poses with different groups of admirers and possible underwriters that then linger, like snapshots, thanks to the use of life-sized photographic cutouts. The effect is a space dotted with different iterations of George — laughing, listening, shrugging, being whoever he needs to be for the people he’s trying to network with. Where Seurat was an artist of the old idiosyncratic sort, self-absorbed and self-reliant to a fault (he held even his fatal illness close to his vest so that his early death came as a shock to friends and family), George is a master of art world politics — which is, arguably, an art form in and of itself. Both Georges may rely on science to enhance art, but there’s a definite sense of artificiality surrounding the great-grandson’s endeavors. Still, an underlying humanity breaks through like sunshine through clouds when, in a lovely scene that unfolds to the song “Children and Art,” George’s grandmother — the 98-year-old Marie (Barber), daughter of Dot and Seurat, raised in North Carolina by her mother and Louis the baker — reminds George of how it’s family that’s the wellspring of life, and points out how Dot appears repeatedly in “A Sunday Afternoon on the Island of La Grande Jatte.” Seurat, Marie reckons, “must have loved her a lot.” It’s a motif of replication that mirrors and ennobles George’s own performance at the reception, inspiring him to reassess his own goals in life and in art. 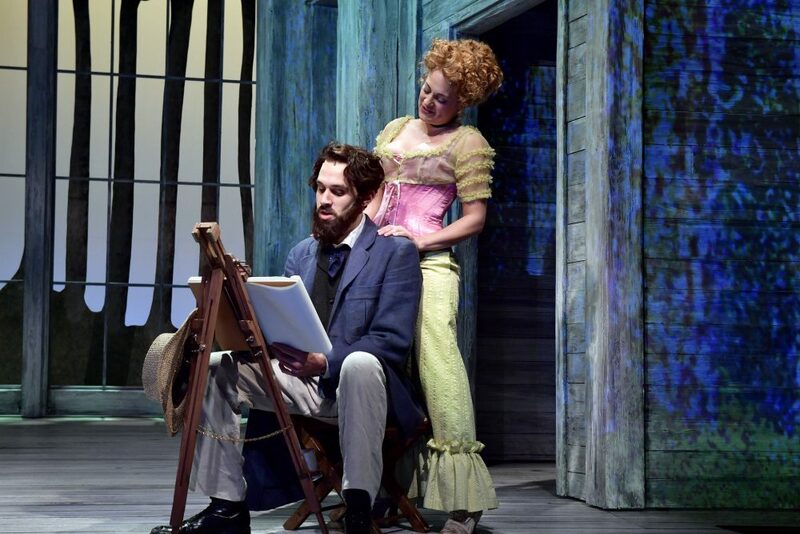 “Sunday in the Park with George” won a Pulitzer Prize as well as two Tonys and a raft of other awards and accolades, thanks to the beauty of its music and the sheer cleverness of its story and design. Seeing it produced here, one understands why. Reduced to an outline, the story doesn’t necessarily seem like it should work — but experienced as an evening of theater, it’s sublime. Director Peter DuBois draws out the colors of this work and takes Seurat’s mantra as his own: “Tension. Order. Design. Balance. Harmony.” This is a play that arrives with some assembly required. 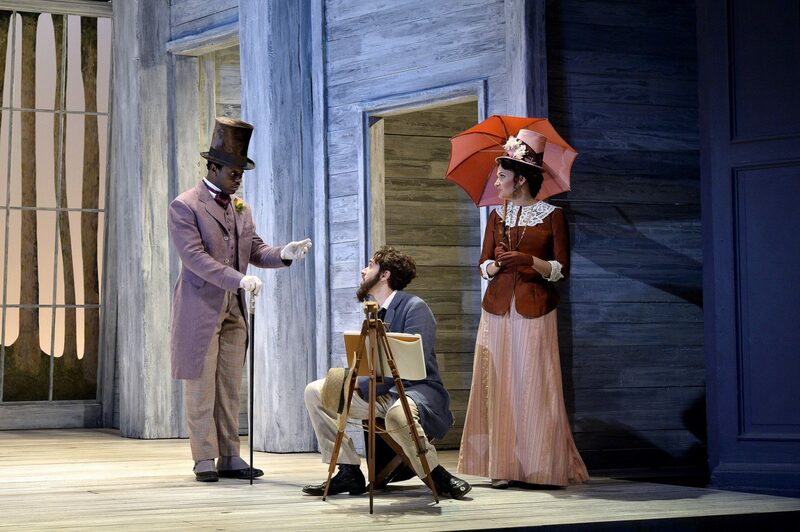 DuBois, together with his cast and crew (many of them veterans from last season’s Huntington production of another Sondheim musical, “A Little Night Music”), has done more than paint by numbers or diagrammatically joined Tab A with Slot B. They’ve created Art. “Sunday in the Park with George” continues through Oct. 16. 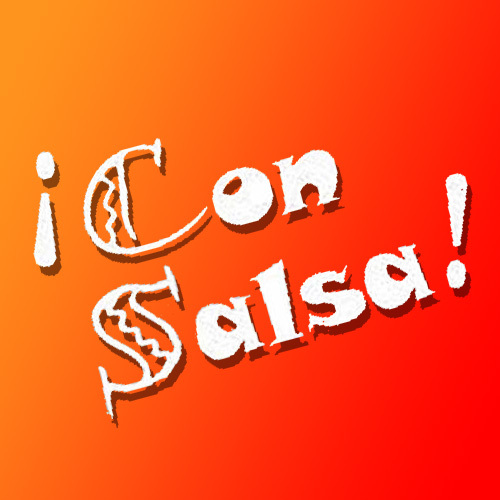 For tickets and more information, visit the Huntington Theatre Company website.